Who is she? : Olivia Palermo; blogger, trendsetter, model and she has even participated in a TV programme. Who is he? : Johannes Huebl (german, yeah ... it couldn't be otherwise). He is model. Why we love them? : Olivia Palermo without Johannes Huebl wouldn't be "Olivia Palermo", I mean, who of us (girls) haven't dreamt sometime to have this husband? (yes, unfortunately the young German is not anymore in the market). If you write in Google (the only man in this world that enjoys gossip) their names, you'll find the most adorable pics you'd ever seen of a couple: always holding hands, always having ideal walks in the roads of NY, always in love with each other (apparently ;)) and last one but not less important...always perfectly dressed and combined!! ¿Quién es ella? : Olivia Palermo; bloggera, trendsetter, modelo y hasta ha participado en un programa de televisión. ¿Quién es él? : Johannes Huebl; alemán (si... no podía ser de otra manera). Es modelo. ¿Por qué nos encantan? 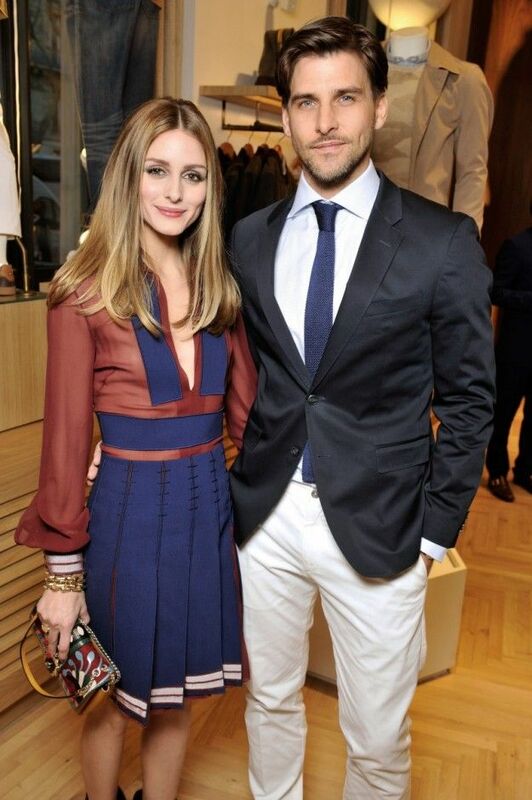 : Olivia Palermo sin Johannes Huebl, no sería "Olivia Palermo". ¿Quién de nosotras no ha soñado alguna vez con tener un marido así? (sí, desafortundamente el joven alemán ya no está en el mercado). Si escribís en Google (el único hombre cotilla en este mundo) sus nombres encontraréis las fotos más adorables de una pareja que hayáis podido ver nunca: siempre de la manita, siempre dando paseos ideales por las calles de NY, siempre enamorados el uno de la otra (eso es lo que parece ;)) y la última, pero no menos importante, siempre perfectamente vestidos y conjuntados!! Who is she? : Behati Prinsloo; model and one of the most famous Victoria's Secret angels. Why we love them? : The attraction of band leaders for models is well known: the 70's had Mick Jagger and Jerry Hall, the 80's...I don't know, the 90's; Johnny Depp (yes, he had a band) and Kate Moss and now, this is the rocker couple of the decade. We don't know if they'll last (artists are very temperamental and womanizers, Adam is not an exception, what's more crisis rumors are pursuing them since July), but meanwhile we enjoy their accurate but in the same time slobby looks...but, SURPRISE!! when the occasion requires it they know how to be the most elegant of the ball! Note: They've been married for one year...place your bets, gentlemen. ¿Quién es ella? : Behati Prinsloo, modelo y uno de los ángeles más famosos de Victoria's Secret. ¿Por qué nos encantan? : La atracción de los líderes de bandas por las modelos es de sobra conocida: en los 70 vimos a Mick Jagger con Jerry Hall, en los 80...no lo sé, los 90 nos dejaron a Johnny Depp (sí, tenía un grupo) con Kate Moss y ahora, esta es la pareja rockera de la década. No sabemos si durarán (los artistas son muy temperamentales y unos picaflor y Adam no es la excepción, además los rumores de crisis los llevan persiguiendo desde julio), pero mientras tanto nosotras nos divertimos con sus cuidados pero a la vez desaliñados looks...pero...SORPRESA!! cuando la ocasión lo requiere saben como ser los más elegantes de la velada!. Nota: Llevan un año casados...hagan sus apuestas señores! Who is he? : Justin O'Shea; Buying Director for the e-commerce website, MyTheresa.com and model. Where? : We don't know where they live but we know that for two months each year they spend one week in NYC, another one in London, another one in Milan and finally in Paris. ¿Quién es él? : Justin O'Shea; director de compras de la tienda on-line MyTheresa.com y modelo. ¿Dónde? : No sabemos donde viven pero sabemos que dos meses al año los vemos una semana en NY, otra en Londres, otra en Milán y otra en Paris. ¿Por qué nos encantan? : Están siempre, siempre juntos y son la perfecta definición de que los polos opuestos se atraen. A pesar de que sus estilos son completamente diferentes, se combinan de maravilla: el rígido estilo gentleman de él se complementa muy bien con el deportivo y ecléctico estilo de ella. Resumiendo, pura inspiración. THE "ELEGANT HIPSTERS" / LOS "HIPSTERS ELEGANTES"
Who is she? : Diane Kruger; ex-ballerina, model and actress. One of the most elegant and stylish actress of the XXI century (one of these nights I'm going to kidnap his stylist ;))). Who is he? : Joshua Jackson, You've already seen his face before, isn't it? Why we love them? : If you remove the Joshua's beard and some wrinkles, you'll see the Pacey Witter's character of Dawson's Creek (yeah, that guy that fell in love with Joey, aka Katie Holmes). I've always hated that character and never understood why Joey was so in love with him...(let's say that I found him insipid) anyway, when you don't like a TV series character you consequently find a little unpleasant the actor. Unfortunately I had to forgive him when I saw who was her girlfriend (they are not married and they don't have plans to). And finally, their "long-term" relationship of eight years being so adorable (almost as cute as "The posh ones") makes one love them and their fantastic-casual-chic-elegant style. ¿Quién es ella? : Diane Kruger; ex-bailarina, modelo y actriz. Una de las actrices más elegantes y estilosas del siglo XXI (una de estas noches voy a secuestrar a su estilista). ¿Quién es él? : Joshua Jackson; ya habéis visto su cara antes, ¿no? ¿Por qué nos encantan? : Si le quitáis la barba y alguna arruguilla a Joshua, veréis al personaje de Pacey Witter de Dawson's Creek (si....ese chico del que se enamora Joey, aka Katie Holmes). Siempre odié a ese personaje y nunca entendí como Joey pudo enamorarse de él (me parecía un pan sin sal, para que nos aclaremos)...en fin, que cuando no te gusta un personaje de una serie sin darte cuenta encuentras al actor "antipático". Desgraciadamente tuve que perdonarlo cuando vi quien era la novia (no están casados y no tienen planes de matrimonio). Y finalmente, su "duradera relación" de ocho años siendo taaaan adorables (son casi tan monos como "Los pijos") hace que una los adore a ellos y a su estilo fantástico, casual, chic y elegante. Who is she? 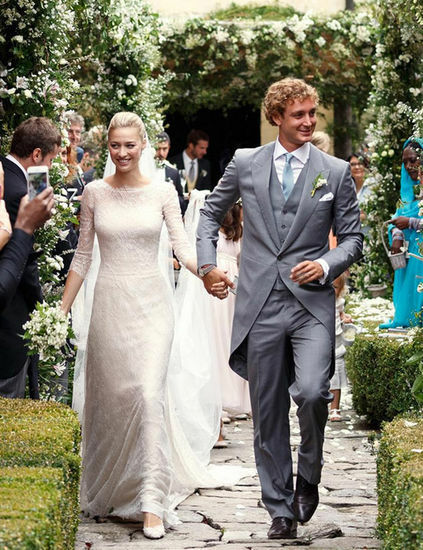 : Countess Beatrice Borromeo; journalist, reporter, model and member of the ancient House of Borromeo. Who is he? : Pierre Casiraghi, He is the grand-son of Rainier III, Prince of Monaco and Grace Kelly. Why do we love them? : Who said that marriage between two aristocratics has to be always for convenience? Well, in this case they're obviously doing bussiness (she comes from one of the richest aristocratic families in Italy and he...he....he's the youngest prince of Monaco... I think there's nothing more to say!! ), but if you look the photos you'll realise that they seem to be so in love with each other, they're so adorable... almost as much as "The Posh" or even more!!. Regarding their styles we have to say that they're the prove that perfection exists; they don't have to wear anything particularly trendy (except for the parties) because they look good even in a potato sack.... yeah, life is hard ladies!! Note: They married in August (a dreaming marriage, every little girl's dream) and a month later paparazzi spotted him getting drunk and in a fancy attitude with another woman who wasn't our beloved Bea.....and now I say....WHY PIERRE??? ¿Quién es ella? : La condesa Beatrice Borromeo; periodista, reportera, modelo y miembro de la antigua familia de los Borromeo. ¿Quién es él? : Pierre Casiraghi, nieto del príncipe Rainiero III de Mónaco y de Grace Kelly. ¿Por qué nos encantan? : ¿Quién dijo que los aristócratas se casaban siempre por interés? Bueno, en este caso están haciendo claramente un buen negocio (ella viene de una de las más importantes familias italianas y él...él...él es el más joven de los príncipes de Mónaco y con esto creo que he dicho todo!) pero si miráis las fotos os daréis cuenta de que parecen estar enammoradísimos el uno de la otra y son taan monos...casí, casí como "los pijos" o más. Con respecto a sus estilismos hay que decir que son la prueba viviente de que la perfección existe; no necesitan ponerse nada particularmente a la moda (excepto en las fiestas) porque tienen estilo hasta con una bolsa de patatas...sí, la vida es dura señoritas!! Nota: Se casaron en agosto (en una boda de ensueño, el sueño de toda niña pequeña) y un mes después los paparazzi lo pillarón a él emborrachándose y en actitud cariñosa con otra mujer que no era nuestra adorada Bea...y ahora yo digo...POR QUÉ PIERRE??? Great post! Each of them look so good together - totally admire their style! Thank you so much Adrià ;)!! Me ha ENCANTADO este post... qué monos todos! packers and movers Chandigarh Relocating House from one place to another place is not an easy task. It can be stressful and traumatic. packers and movers Chandigarh makes easy. packers and movers faridabad Simler move with movers and packers Faridabad. Best packers and movers Faridabad for home relocation and pet moving. More Detail about Movers Packers Faridabad. Plant Shifting with Best Packers and Movers in Faridabad. packers and movers Hyderabad Got a reason to shift in or out the City of Pearls, but worrying how to do it? Then, you have come to the right place. Our network is well established all across the city, which ensures smooth, safe and timely shifting solutions.